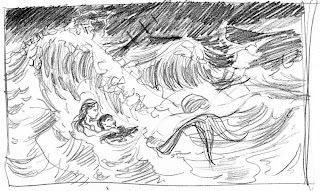 The painting was going to be of the little mermaid rescuing the prince when his shipwrecked in a storm. I was a little intimidated to take on a project involving a storm in the middle of the ocean. I haven't spent time painting seascapes and I knew that finding references for storm waves would be a challenge. Not to mention that I had no idea what my lead characters would look like floating together in the water. A first I thought I could get away with just setting up the models in the studio but after the initial shoot, decided to go all out and find a pool. Friends of mine were kind enough to let me use their pool and set up my studio flashes on either side. My hope was that one would represent the lighting and the other would act as a fill light. Unfortunately my "fill light" was too strong and I didn't realize it until later. But I gathered some great information about how my figures would interact in the water (It helps to have a volunteer pound the water to give us the waves). As I developed the painting, I moved the lightning which caused me to have to reshoot the reference for my prince. By the way, I dressed up the prince in a nice costume with a vest and everything (maroon puffy-sleeved shirt and blue vest) but everything looked black once it was wet.